Roger Shields “works up” a turkey he trapped from Tall Timbers Research Station during a research project. He’s aging the turkey by the appearance and contour of the bird’s ninth and 10th primary wing feathers. 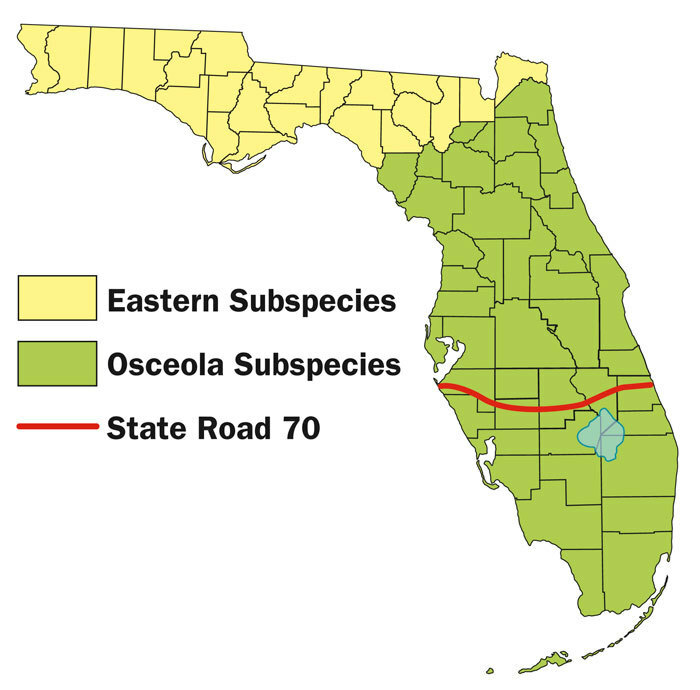 Wild turkeys flourish within many Florida habitats including pine flatwoods, turkey oak sandhills, oak hammocks, cypress woods and bottomland hardwoods. With much of Florida having a nearly year-round growing season, vegetation quickly grows too thick for turkeys to easily see and move through. Because of this, the FWC and other public land managers continue to employ a variety of tools and methods to improve habitat quality. The FWC partners with multiple government agencies and other conservation organizations to pool their resources and improve more habitat. 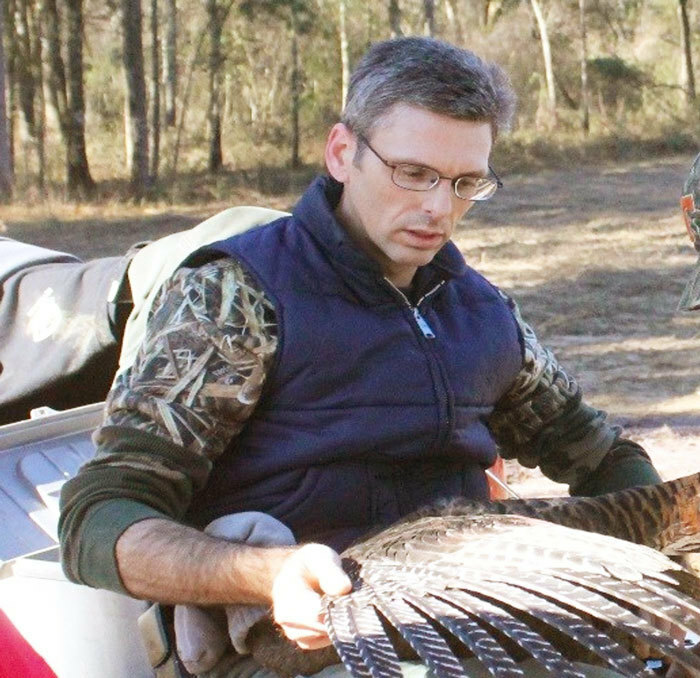 One such cooperative funding program is the wild turkey cost-share program between the FWC, the Florida Forest Service and the Florida State Chapter of the National Wild Turkey Federation. “We’ve been involved with this program for 25 years and, this year, our nearly $500,000 in cooperator funding combined with matching and in-kind funding totals more than $2.2 million to pay for 37 habitat improvement projects on 29 wildlife management areas, including creating wildlife openings and planting food plots,” Shields said. Projects for this year include reducing hardwoods and cabbage palms on DuPuis and Picayune Strand WMAs. FWC biologists also frequently work with private landowners who seek assistance with managing their properties for turkeys. Through combined efforts of the FWC, private landowners and public land managers, wild turkeys are healthy and flourishing in Florida. And if you’re a hunter and turkey enthusiast, then you’re extra excited for this time of year because of spring turkey season and youth turkey hunt weekends. Youth hunters may take part in the two-day youth spring turkey hunt, which occurs on private lands and on 81 WMAs the weekend prior to the opening of spring turkey season. South of State Road 70, that youth weekend was Feb. 23-24. Above State Road 70 in the rest of the state, that weekend falls on March 9-10. Only those 15 years old and younger are allowed to harvest a turkey while supervised by an adult, 18 years or older. There are 26 WMAs that do not require a youth spring turkey quota permit. Spring turkey season south of State Road 70 always begins the first Saturday in March. This year it is March 2, running through April 7. In the rest of the state, it always opens the third Saturday of March, with this year being March 16 through April 21. There are 43 WMAs that have “walk-in” opportunity and don’t require a quota permit to hunt some or all of the spring turkey season. On private property, any legal rifle, shotgun, PCP pneumatic air gun of at least .20-caliber, muzzleloader, crossbow, bow or pistol may be used to take turkeys. However, the allowed methods of take during spring turkey season are more restrictive on WMAs. Rifles and pistols are generally not allowed, and shotguns must use shot no larger than No. 2, so that means no buckshot or slugs. Check the WMA brochure on the area you wish to hunt to be sure. Besides a hunting license, you’ll need to buy a turkey permit. For Florida residents, the turkey permit costs $10. For visitors who may be seeking an Osceola to complete one of the “slams” or who want to begin their season in the Sunshine State, the permit costs $125. And if you plan to hunt on a WMA, you also must purchase a management area permit for $26.50. These licenses and permits can be purchased with a credit card at GoOutdoorsFlorida.com or by calling 888-HUNT-FLORIDA (486-8356). They can also be purchased in Florida at county tax collectors’ offices and at most retail outlets that sell hunting/fishing supplies. 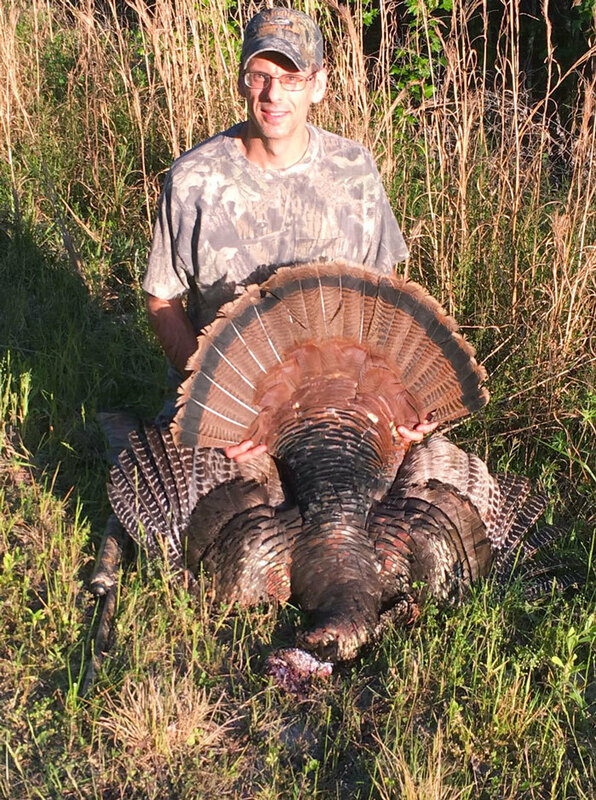 FWC Wild Turkey Management Program coordinator and biologist Roger Shields harvested this nice gobbler in Madison County.